The beekeepers at Rent Mother Nature had all kinds of weather this spring–cold, cool, hot, warm, some bursts of rain– but now that summer is here, it is mostly warm with some cool days. The bees seem to have taken it all in stride and are busy now pollinating, gathering nectar, and making honey. The little creatures have preferences in the blossoms they covet. The dandelion is one of their favorites. Bird-damaged fruit from which they can extract juice is also high on their list. They are also fond of lima beans (as I am, although I prefer them cooked). Because wild rose blossoms are a delicacy to the bee, the beekeepers take care to place their hives close to the rose beds. Once they have been positioned, the beekeepers try not to move them beyond a radius of three miles. Bees soon get acquainted with every inch of country within two miles of the hive. They easily remember landmarks to guide them home, and if the hive is not where they expect to find it, they become disoriented. In the general honey report, we described the amazing world of the Dancing Bee. Waggles, jiggles, and hopping about by the scouts convey directions to the sources of pollen and nectar, as well as describing the distance to their hive. There are many other rituals that continue to baffle even seasoned beekeepers. 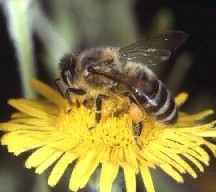 For example, what does it mean when bees hang head-down in the comb and vibrate for what seems like ages? (One apiarist suggests that since this behavior occurs in hot weather it may be her way of cooling off –the bee acting as her own fan). Young bees inform each other when it’s play time, and they sometimes break out of the hive in a group like human adolescents and frolic in a play-fight within 25 or 30 feet of the entrance. This usually occurs after a boring cool or damp spell. After play, they straggle back and take up the chores they have yet to do (quite unlike any teenagers that we know). Then there is the Singing Bee (not like a songfest in school). Actually, it is more like a pleasant humming. All beekeepers know when a bee is angry–the furious flapping of its wings sends everyone swatting and bounding indoors to safety. When the entire hive is contented, there is a pleasant hum; when the colony is about to swarm to a new location it literally “buzzes with excitement”. We have picked some expressions, etc. with the name “bee” in them–mostly dated slang. Wishing you a splendid summer!